Is my soil suitable for growing trees? Soil should be not be waterlogged or susceptible to water logging for long periods of time, in these conditions the trees will drown and will not survive. Ideally the pH of your soil should be slightly acid between 6 and 6.5 but up to 7 is just about tolerable. A pH of over 7 would be a problem because some nutrients would not be available to the trees. A Phosphate index 3, Potassium 3 & Magnesium 3 is desirable. If in doubt you may like get a soil analysis done, we would suggest Lancrop Laboratories. For planting tips please see John's planting video and our planting guidelines. 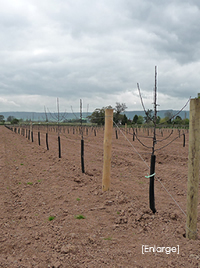 How to mark out your new orchard for planting. 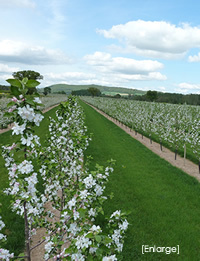 To plant an orchard so that your trees are in straight lines from any angle that the rows are viewed from takes care. Here are some tips to help you. What planting distances should I have and how many trees do I need? Popular planting distances for bush apple trees is 8ft x 18ft (trees 8ft apart and rows with a width of 18ft) In metric that is approximately 2.5m x 4.5m. These distances give a tree planting density of approximately 303 trees/acre. 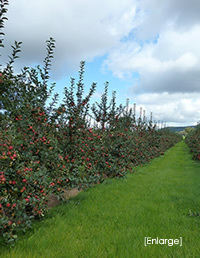 Popular planting distances for standard apple trees is 30ft x 35ft (trees 30ft apart and rows with a width of 35ft). In metric that is approximately 9m x 10.5m. These distances give a tree planting density of approximately 40 trees/acre. When calculating the number of trees you need to order it is suggested that you deduct 12.5% of the total to allow for lost planting space due to headlands and irregularities in the shape of the planting area. If possible it is preferable to plant rows in a north/south direction to maximize light to the trees. When you receive your trees. It is possible that tree roots will have dried out to some extent during transit so please inspect them immediately and if necessary soak the roots in water for an hour or two. How do I tell the varieties of my trees? Trees are either labelled individually or for larger orders they will be labelled in bundles of up to 10. In addition to this each tree is marked with a paint colour particular to that variety. These colours may change occasionally from year to year but we do aim to keep them consistent. Click below for the colour index charts [pdfs].